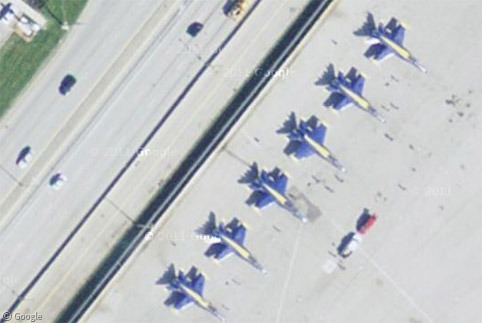 Today Google have released a new kind of aerial imagery in Google Maps, which features images using a 45° angle; similar to Microsoft’s Bird’s Eye imagery. Previously available in select US locations to users of Google Maps Labs, the angle used in the images allows us to see the sides of buildings – you can even rotate around a point of interest (using the compass ring) to view it from four different perspectives. To see the new imagery, simply zoom into an area while in Satellite mode, and the imagery will switch from an overhead to 45° angle if the new imagery is available. We can’t display the 45° imagery in our embedded map yet, but the imagery is already available in several worldwide locations, and Google have of course created a map of all the places where it is available. As an attempt to combat the threat of the (often superior) imagery available on Microsoft’s Bing Maps service, the coverage will presumably eventually expand to cover many more worldwide locations. This should provide incredible sightseeing opportunities for all fans of Google Maps – what will you find? Via the Google Latlong blog. Guy Caught Taking a Leak On Google Maps Street View! I’ve updated the post though, thanks for keeping me straight.